7/18 Cup of Coffee: One of the major milestones of the season took pace Monday evening, as the Red Sox top draftee made his first professional appearances. Tanner Houck (pictured) drew the start in game two of Lowell's doubleheader, showing some early jitters but also a glimpse of why he was so highly touted. Elsewhere, the PawSox staged an improbable comeback from an 8-0 deficit, while Jhonathan Diaz pitched Greenville to victory. After Toledo raced out in front, with eight runs in the first, the PawSox inched back, scoring runs in five different innings for the comeback win. Making his McCoy Stadium debut, Rafael Devers went 1 for 3 with a walk and a pair of runs scored. Two days after Devers made his PawSox debut, Tzu-Wei Lin suited up for his first Triple-A game--despite now having 50 major league plate appearances under his belt. Lin started at shortstop and was 0 for 5. Dan Butler had a monster day at the plate, blasting a two-run homer in the fourth inning and following up with a three-run shot in the fifth. Aneury Tavarez had his sixth straight two-hit game, a stretch that has boosted his OPS nearly .300 points. After Edgar Olmos struggled in his start, the bullpen combined for 8 1/3 shutout innings of masterful relief. Shawn Haviland carried the bulk of the load, scattering four hits across 6 1/3 frames. Ben Taylor and Noe Ramirez followed with a scoreless inning apiece. Teddy Stankiewicz was cruising, throwing five scoreless innings when he hit a wall and surrendered four runs to Trenton without recording an out in the sixth. With Devers now in Triple-A, Michael Chavis assumed the role as the impact bat in the Portland lineup. The 2014 first-round pick doubled and homered as part of a 3-for-4 evening. Unlike the PawSox, Salem was not able to dig out of its early hole. Just two of the six runs allowed by starter Shaun Anderson were earned in his 5 2/2 innings. He struck out seven against just one walk in the loss. Leadoff man Chris Madera tripled and scored a pair as part of his 2-for-5 evening. Austin Rei and Bryan Hudson also had a pair of hits apiece. Jhonathan Diaz was excellent on the mound for the Drive, allowing a run on three hits in six innings, striking out five against just two walks. It was the first time Diaz went six full since back in 2014 when he was pitching in the Dominican Summer League. Algenis Martinez and Hunter Smith combined for three innings of scoreless relief to preserve the win. Tyler Hill and Tucker Tubbs had two hits apiece to lead the offense. The Spinners managed only three hits but prevailed in the first game of their doubleheader with some dominant work on the mound. Roenis Elias got the start in his first rehab appearance, striking out two in two perfect innings of work. Undrafted free agent Durin O'Linger followed with five innings of shutout ball, surrendering five hits and striking out a pair without issuing a walk. Marino Campana notched the only extra-base hit, an RBI double in the fifth inning. 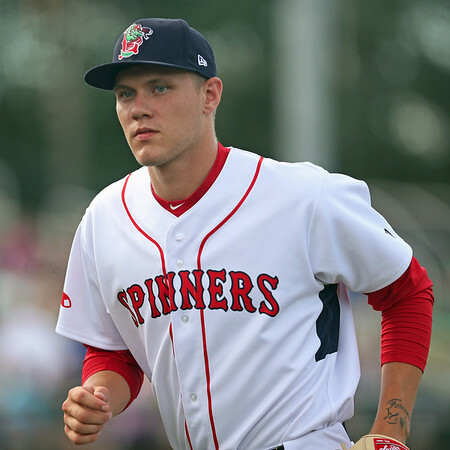 The biggest happening in the organization came in the nightcap, as Boston's top draft pick Tanner Houck made his professional debut. It was something of a rocky start for the 24th-overall pick out of the University of Missouri, who allowed three runs (two earned) in an inning of work. Houck struck out two, walked one, and threw 16 of 26 pitches for strikes. SoxProspects.com Director of Scouting Ian Cundall was in Lowell and reported that Houck's fastball was in the 94 to 97 range and that he got four swings and misses on his slider. It was Houck's first appearance in nearly six weeks, following a college campaign in which Houck posted a 3.33 ERA in 94 2/3 innings. The GCL lineup was firing on all cylinders on Monday afternoon. Rehabbing shortstop CJ Chatham was 2 for 2 with a three-run homer before being removed from the game in the bottom of the second inning. Kervin Suarez continues to be a force out of the leadoff spot. The second baseman was 3 for 5 with a pair of doubles and three RBI. Pedro Castellanos was 2 for 4 with a walk and now has multiple hits in seven of his 16 starts. On the mound, Angel Padron gave up two runs in five innings of work, striking out seven to get the win. Despite the commanding lead, Eduard Bazardo was credited with a save for his four innings of work out of the bullpen. He allowed a run on three hits, striking out three without walking a batter. With the rain-shortened win, the Sox are now 13-2 in the month of July. The pitching continues to shine, with Andres Jimenez the star on Monday. Jimenez allowed a run on only one hit, striking out three and walking one, and he now possesses a 5-0 record on the year. Shortstop Ivan Houellemont paced the offense, going 2 for 3 with a triple and a pair of RBI. Player of the Day: On a day of excitement because of the debut of the newest first-round pick, it seems almost appropriate that the top player was an undrafted free agent who has been in the minor leagues longer than anyone in the system. Dan Butler, a backup catcher while at the University of Arizona, joined the Red Sox organization in 2009 and has been with the team for all except a one-year hiatus with the Nationals in 2015. On Monday, Butler played a major role in Pawtucket's nine-run comeback rally, hitting two-run, and three-run homers as part of a three-hit effort. Butler has 54 home runs as a professional, 53 of which have come with a Boston affiliate.